a place with rural and modern character that can be your home during your vacation: Beautiful rural environment, secluded location for perfect vacation. 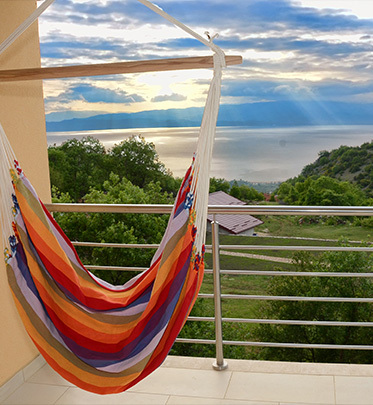 The villa is just 5 minutes driving away from the center of Ohrid and offers excellent view on the Ohrid Lake and the coastline of Ohrid. The villa is in the mountain overlooking the Ohrid lake and gives Ohrid its unique freshness, clean air and unparalleled scenery. Excellent for relaxing and resting from busy everyday life. The villa is modern with all the comforts: Wi-Fi, satellite TV, sound-proofed and thermally insulated walls as well as very comfortable furniture, a rural front and back yard with plenty of shades to sit and relax. There is also a barbecue lot for a unique dining experience and a delux Sauna with panorama window, for unforgetable relaxing hours. The building itself has the unique Ohrid-architecture integrated into a modern unobtrusive architectural plan.